Dr. Gellad's research focuses on physician prescribing practices and on policy issues affecting access and adherence to medications for patients. He was the recipient of a career development award from the Department of Veterans Affairs to study the quality and efficiency of prescribing in the VA and is currently funded by the VA, NIH, State of Pennsylvania, and private foundations on multiple studies of pharmaceutical policy and prescription use. His work spans clinical areas, from diabetes, to hepatitis c, to prescription drug and substance abuse. His policy area of expertise is prescription drug pricing and spending. He is a former member of the Food and Drug Administration (FDA) advisory committee on nonprescription drugs and FDA Drug Safety Oversight Board. Dr. Gellad is also a nationally recognized authority on improving the measurement of medication adherence. In 2015, he founded and chaired the first national conference focused on improving the science behind medication adherence measurement. 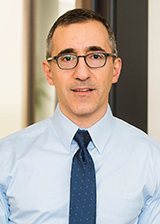 Dr. Gellad is board certified in internal medicine and completed a residency and chief residency in internal medicine at Brigham and Women's Hospital and Harvard Medical School. He sees primary care patients in the VA Pittsburgh Healthcare System and attends on the inpatient general medical service. Gellad WF, Flynn K, Alexander GC. Evaluation of Flibanserin: Science and Advocacy at the FDA. JAMA. 2015. Anderson T, Dave S, Good CB, Gellad WF. Prevalence of Academic Medical Center Leadership on Pharmaceutical Company Boards of Directors. JAMA. 2014; 311(13): 1353-5. Gellad WF, Donohue JM, Zhao X, Mor MK, Thorpe CT, Smith J, Good CB, Fine MJ, Morden NE. Brand-Name Prescription Drug Use Among Veterans Affairs and Medicare Part D Patients with Diabetes: A National Cohort Comparison. Annals of Internal Medicine. 2013; 159(2). Gellad WF, Donohue JM, Zhao X, Zhang Y, Banthin JS. The Financial Burden From Prescription Drugs Has Declined Recently For The Nonelderly, Although It’s Still High For Many. Health Affairs. 2012; 31(2). Donohue JM, Morden N, Gellad WF, Bynum J, Hanlon JT, Skinner J. Sources of Regional Variation in Medicare Part D Drug Spending. New England Journal of Medicine. 2012; 366(6). Gellad WF, Grenard JL, Marcum ZA. A Systematic Review of Barriers to Medication Adherence in the Elderly: Looking Beyond Cost and Regimen Complexity. American Journal of Geriatric Pharmacotherapy. 2011; 9 (1). Gellad WF, Grenard J, McGlynn EA. A Review of Barriers to Medication Adherence: A Framework for Driving Policy Options. RAND Technical Report. 2009; TR-765-MVC. Gellad WF, Zhao X, Thorpe CT, Mor MK, Good CB, Fine MJ. Is Dual Use of Veterans Health Administration and Medicare Benefits Associated with Overuse of Test Strips in Veterans with Type II Diabetes?. JAMA Internal Medicine. 2015; 175(1): 26-34. Carico, R, Zhao, X, Thorpe, CT, Thorpe, JM, Sileanu, FE, Cashy, JP, Hale, JA, Mor, MK, Radomski, TR, Hausmann, LRM, Donohue, JM, Suda, JK, Stroupe, K, Hanlon, JT, Good, CB, Fine, MJ, Gellad, WF. Receipt of Overlapping Opioid and Benzodiazepine Prescriptions Among Veterans Dually Enrolled in Medicare Part D and the Department of Veterans Affairs: A Cross-sectional Study. Annals of Internal Medicine. 2018; 169 (9): 593-601.